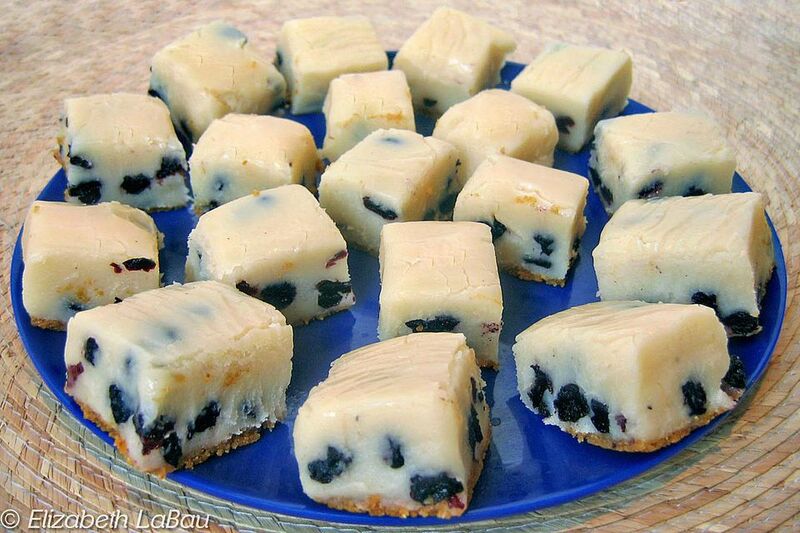 Blueberry Cheesecake Fudge is like a little bite of cheesecake in fudge form! A cream cheese base, studded with dried blueberries, sits atop a graham cracker crust in this beautiful, tasty fudge recipe. You can substitute other dried fruit for the blueberries, but do not use fresh or frozen fruit, as the moisture will ruin the fudge. You can also omit the graham cracker layer to simplify things. Try serving this fudge in small wedges to REALLY resemble cheesecake! Place the graham crackers in a food processor or blender and blend until you have very fine crumbs. Add two tablespoons of granulated sugar and 1.5 ounces of softened cream cheese, and pulse until the mixture starts to come together and looks crumbly. It should hold together if you squeeze it in your hand, but should not be too moist or sticky. Press the graham cracker mixture into a thin, even layer on the bottom of the prepared pan. Don’t worry if it seems too dry to form a solid crust--the layer of fudge on top will solve that problem. Place the sugar, butter, evaporated milk, and miniature marshmallows in a large saucepan over medium heat. Stir until the butter melts and the sugar dissolves. Bring the mixture to a boil, stirring frequently. Once boiling, begin to stir constantly and cook, stirring, for five minutes. After five minutes remove the saucepan from the heat and stir in the remaining 6.5 ounces of cream cheese and the white chocolate chips. Mix until the fudge is entirely smooth and free of lumps. If the white chocolate chips do not dissolve easily, return the pan to the heat briefly and stir over the heat until they melt. Add the dried blueberries and vanilla to the fudge and stir until they are well-mixed. Pour the fudge into the prepared pan and smooth it into an even layer. Refrigerate the fudge until it is set, at least 4 hours. Once set, remove the fudge from the pan using the foil as handles. Cut the fudge into small one-inch squares to serve. Store Blueberry Cheesecake Fudge in an airtight container in the refrigerator for up to one week, and bring to room temperature before serving. Click Here to View All Cream Cheese Candy Recipes!